Every single one of us at one point of our life wasn’t able to have ANY logical argument regarding the very noticeable fact of our ATTACHMENT (or let’s say obsession) to a particular person or a past event. It is like teenage years all over again. Expect you have much less time to be obsessed as no one said the life will wait while you try to fish out any rational thought from the wonders of your inflamed mind. The only question that probably arises during times like this is What is happening?!?! I am a rational, SMART woman, why can’t I get OVER this (him)?! Or the more common one after reconsidering all possible answers is HOW TO END THIS?! 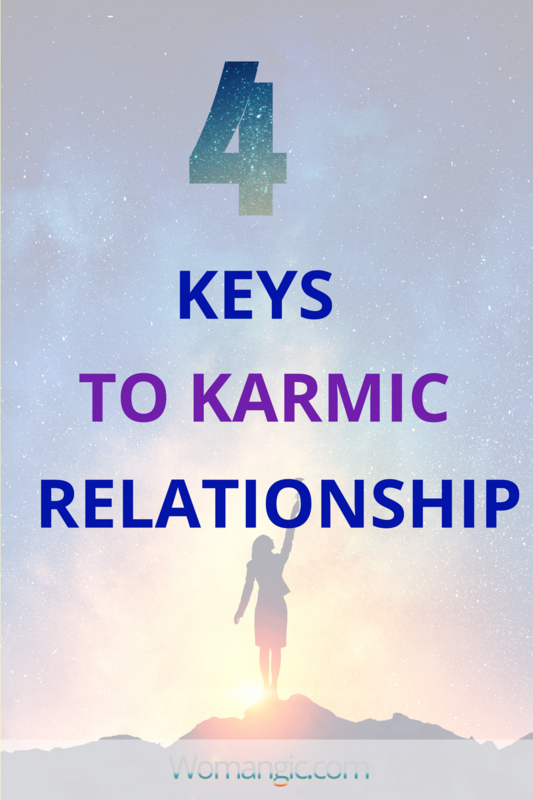 If you are experiencing something like this, you are probably involved in a karmic relationship. 1. When you met a person it seemed like a "love from first sight"
2. Your relationship and communication are very intense and emotional. Karma isn’t any magical “punishment” or “suffering for something”. It is simply the most perfect and specific circumstances for a particular person to learn a particular lesson. Karmic relationship or any other karma is a very strong attachment that can last for years. Fortunately, nowadays we have a possibility to free ourselves from karma much faster. During evolution, our Soul gained enough wisdom to learn lessons faster. How can I possibly know that you're in particular have this wisdom? The answer is very simple. If you're reading this article, you are. The Universe brought you all this way so you can find the information that will remind you of the wisdom of your own beautiful Soul. If you are here, you came to the moment n your life when you're ready. You've been through enough and now it is a perfect time to release any toxic attachment or end pain of negative karma in your life. I truly believe everything happens for a reason. I proved it many times. The great correlation between thoughts and reality, true care the Universe provides, even if in the darkest moment it seems like the end of the world. Crying and sleepless night over a guy who hurt you. Healing and rising. To meet him a couple of years after for a friendly chat or just accidentally and fall on your knees in the deepest gratitude to the world, you haven’t even known you can experience, gratitude for the pain you went through. THANKS, Universe, THANK YOU for holding me away from this person. He might be a good guy or a real a**hole, it isn’t a point. A point is it’s so much NOT me, and I was blind to see it, but the Universe saw. I resisted, I wanted to keep it, so the world made me go through pain to SAVE me, to show me better, to make me learn to be a better me so I can create one life that truly aligns with my deepest values. We can’t argue we learn pretty well through pain, BUT is there the other way? Can we stop learning through pain and release negativity in our lives? The universe takes care of You. In a very deep, caring way. The ONLY function negative Karma have in our life is to make us learn. Learn more about ourselves, what we’re capable of, what our true desires are and what negative assumptions we keep inside. 1. We go through pain in a right way. We don't get stuck in disappointment and open our hearts and minds. 2. We close up. Feel disappointed, betrayed. And we attract a similar man in our life... Who hurts us again. the circle repeats. Have you ever noticed how the same irritating or painful situation with a guy or at work repeats over and over again? It means the lesson hasn’t been learned, the wisdom this situation holds is strongly resisted by you. As soon as the wisdom is accepted by you, the problem is gone. Think about your life… I am sure there was a moment when you struggled with something and then bum, a flash of understanding or feeling of clarity, and the problem dissolved without any logical reason. Imagine a hard situation in the form of air balloon with the light inside of it. It has a bright, beautiful, crystal clear glow in the middle, which surrounded by dark, dirty smog. These balloons are guidance made by the Universe to show you the way to your best life. You walk on the path of your unique life and to get to the next level you need to reach the glowing light you see in the middle of the balloon. So you touch the balloon. The way we used to reach the wisdom (glowing light) inside of the balloon is by blowing it. The smog goes all around you, you start to cough and cry, hate it all and completely forget why you’ve even started it. It seems so hard, your eyes and chest hurt, all the world seems different. You struggle for a while and then the smog clears away. You start breathing deeper, slowly bit by bit you put your head up again, It takes time, sometimes a lot. But you do, You open your eyes and you see this amazing light that stayed. You see this incredible glowing beauty, you cry from happiness. You touch it and it fills your heart with light, happiness, deep wisdom and true appreciation. Now you finally remember why you touched this damn balloon! You walk along your life happy, everything is so beautiful… and then you see the other balloon and you feel there is something inside of it for you…. Experience in working with thousands of women proved what I felt to be true. The big lesson that karmic relationships have for wholehearted women is self-worth. At some point in our life, we meet a karmic partner who put us to the bottom so we can rise. Often karmic relationship has a purpose to motivate us to take better care of ourselves, understand ourselves, unleash our gifts and talents. So when we start doing it, karma releases as it's purpose is fulfilled. Everything in the Universe seeks balance, so when you figured out what karmic relationship teaches you, the force has no opposite energy to keep this particular karmic relationship in your life. As one of the purposes of karma is balancing, we often meet karmic partners who are meant to show us in balance in our life. Men and women are united by the force of female and male energies. If you have more masculine energy in you and suppress your female side, you just can't attract a man with strong masculine qualities. Your energies are similar, but they don't fill up one another. Similar energies can form amazing friendships, sexual connection. But not a fulfilling relationship. He simply can't respect or appreciate you, because you don't have what he needs. He seeks balance, what will make him stronger as a man. Your masculine side makes him want to communicate with you or have a physical connection, but not appreciate you as a woman. What any man with strong masculine qualities is looking for is a woman with a strong female side. A woman who knows her worth, respects and nourishes both her masculine and female energies.